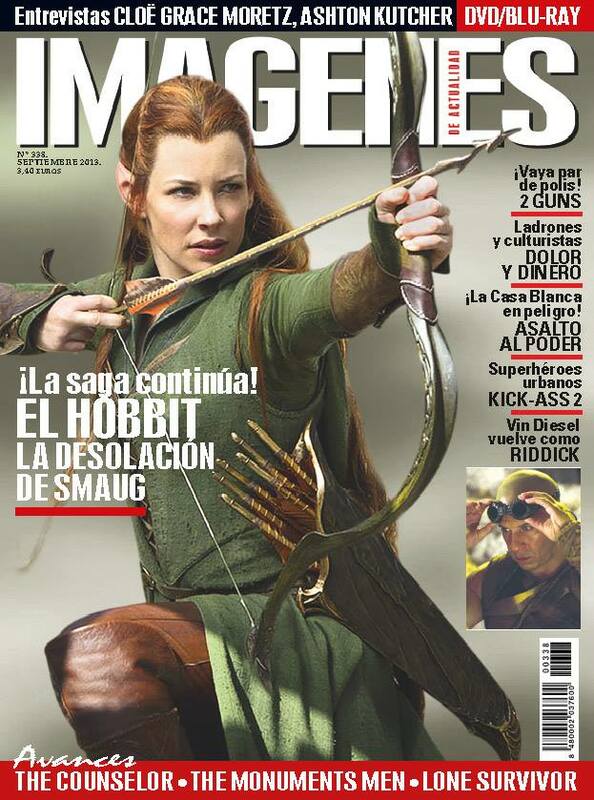 According to our Spanish friends at Elanillounico.com, Imagenes Magazine has just published a new edition that contains a five-page feature dedicated to The Hobbit: The Desolation of Smaug. Details are a bit sketchy (also, Google translate is not very good and I don’t understand Spanish! ), but Elanillounico.com seems to indicate that there’s mention inside of a certain elvish butler we know from The Hobbit (Galion), who it seems is played by kiwi actor Craig Hall. Ringer and guest writer Tedoras comes to the rescue with the following interesting little details from the article. Warning for potential spoilers, and if anything more that’s interesting comes to light, we’ll be sure to keep you updated! 1. The article implies that Azog AND Bolg will be hot on the Dwarves’ trail in The Desolation of Smaug. Tedoras notes: I know not what to make of this — but it is certainly a major error of sorts. I have read this section many times, and this is exactly what is written. 3. On the fifth page of text, the article states that PJ’s first choice for Thranduil may in fact have been Doug Jones of “Hellboy” and other del Toro films. 4. The article seems to imply that Narzug, an orc from AUJ, will appear in the second film, as it lists him among characters new to The Desolation of Smaug. 5. Lastly, they quote an interview PJ did with “Empire” in which he states that the second film is where the plot tends to sub-divide; just as we saw the many plot paths in The Two Towers film, so, too, shall we journey with different groups of characters in The Desolation of Smaug. I take this to mean a subdivision between Bilbo and Company, Gandalf/Radagast, and Legolas/Tauriel. Ringer Edualy also chimes in with a few little snippets from the magazine. Tauriel: Silvan elf, chief of the guards that protect the kingdom ruled by Thranduil, legolas’ father, at the heart of mirkwood. A Tolkien enthusiast, Lilly admits she’s been a fan of the novels since she was 13. Thranduil: king of the silvan elves of mirkwood and father to legolas. Jackson says: “casting for Tolkien’s stories is very complicated; even more so when choosing the elves. Lee was my first choice for Thranduil. He’s a great actor. I loved his interpretation in a movie i saw some years ago titled The Fall. And since then i hoped to one day work with him. When we began discussing about Thranduil, lee came up to my mind immediately.” Nonetheless, other sources affirm that Jackson’s first choice could have been Doug Jones, a regular from Del Toros films. Bard: the king of Dale is played by this ascending British actor whom we’ve seen in the recent The Three Musqueteers, Fast and Furious6, and who will give life to Vlad the Impaler/Dracula (directed by Gary Shore; out 8/8/2014. Stephen Fry: one of the best know actors of his generations, best remembered for Wilde and V for Vendetta. Craig Hall (Galion): Bard’s Steward, he worked for Peter in King Kong. Ryan Gage (Alfrid): Gage is an Australian import that’s worked mostly for the tv/film industry of his country. John Bell (Bain): this young actor, playing Bard’s son, previously worked in Battleship. Ben Mitchell (Narzug): a regular of the New Zealand film industry. Demosthenes’ note: As Tedoras indicated, it does certainly look as though there is a little bit confusion over some of the less major roles among the article’s author and editors. Galion is, of course, the steward of Thranduil, not of Bard. Thus it seems most likely that when they speak of Bard taking Thorin & Co prisoner, they do in fact mean Thranduil and got the names mixed up.